Cambria-Veneer, a casegoods line high on traditional styling and easy on the budget. A smart collection in rich walnut veneers that offers exquisite pull options and moldings for that classic look or go without for that clean transitional feel. 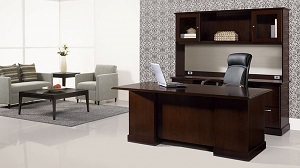 Cambria makes it easy to accommodate your office with stylish selections.